The keys to the obstetric kingdom lie in the language. 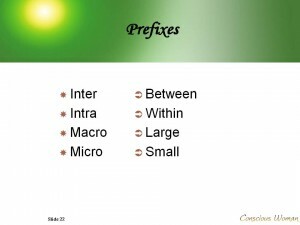 Learning medical prefixes, suffixes and root words will give you the tools to interpret the language. You’ll be able to use extra long, impressive words like “neurofibromatosis” in no time, and have fun doing it! One of Gloria Lemay’s twelve Essentials of Maternal-Infant Care presentations for birthing professionals and other care providers who work with women during the childbearing year. This series also benefits students of all levels who wish to delve into issues that arise repeatedly in clinical practice.